Headstones toppled by vandals at Mount Carmel Jewish Cemetery in the Wissinoming section of Philadelphia. 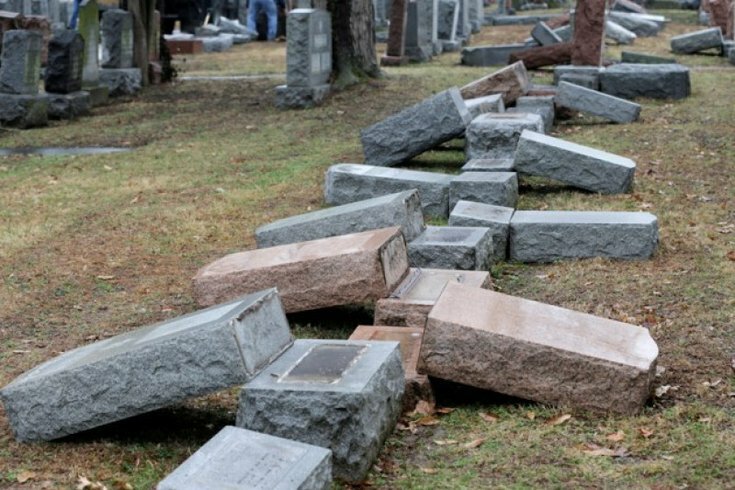 A crowdfunding campaign to support the repair of more than 100 headstones damaged over the weekend at Philadelphia's Mount Carmel Jewish Cemetery is calling for solidarity after the hateful act of vandalism was discovered early Sunday morning. Authorities continue to investigate the crime, which they believe took place some time after dark on Feb. 25. A combined $13,000 reward has been offered by the Anti-Defamation League, the Mizel Family Foundation and the Philadelphia Fraternal Order of Police Lodge #5 for information leading to the arrest and conviction of those responsible. "We must allow the investigation to take its course before we can determine a specific motive or label as a particular type of crime," police said in a statement Monday. "However, this is an abominable crime that appears to target these particular headstones. We will continue to work to determine the person(s) responsible and make sure that they are held accountable for this reprehensible act." The Philadelphia Building and Construction Trades Council, led by John Dougherty of IBEW Local 98, also pledged to replace the cemetery's toppled tombstones, re-sod damaged gravesites, and install additional lighting and security cameras free of charge. A GoFundMe campaign launched Sunday by a private citizen, Raphael Caroline, has already surpassed its goal of $10,000 within 24 hours, collecting more than $16,000 from 400-plus donors. "This is the most recent of a series of hateful acts that have befallen the Jewish community in our country recently," Caroline wrote. "Let us stand up together and show that love and community will triumph over hate and bigotry." The crowdfunding money is being raised independently and will be sent by personal check to the Jewish Federation of Greater Philadelphia, since the cemetery is not set up to receive independent funds. All funds will supplement the Jewish Federation's own fundraiser. On Monday, amid another wave of bomb threats at area Jewish community centers, Pennsylvania Gov. Tom Wolf issued a statement on the vandalism at Mount Carmel Cemetery. Donations to the GoFundMe page can be made here.